Start your site's traffic from scratch and get more adult traffic than your server can handle! It's the world's most advanced and secure adult traffic trading script.... And its 100% FREE!!! 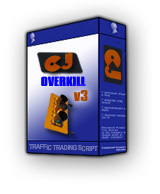 CJOverkill is a powerful traffic trading script that keeps its users happy with their site's growing traffic. Tested on high traffic sites and proven its outstanding performance, CJOverkill's security measures prevent others from trying to cheat you. With this script ,you can rest assured your site is in good hands. An advanced, up-to-date script with cutting edge features, CJOverkill will boost your traffic and take your trading to a new level!